Selling products online is getting more popularity day by day. Since shopping online offers much more convenience and comfort, there is no sign of slowing down the popularity whatsoever. People can choose products of their liking and if it fits the need then you can order the product from the comfort of your home. And there is that refund and return policies. Everything about online shopping is just that much persuasive. Now fast-forward to 2019, ecommerce businesses are bigger than ever and since fashion items like apparels and other accessories are one of the prominent selling products in ecommerce businesses, the need of photo retouching for fashion accessories and appeals is indispensable. In online businesses, visual is everything. It determines how good or attractive the product is, hence prompts the customer to click the link and possibly making them buying things afterword. Visual memories play a salient role in determining, understanding and deciding things. Hence, as humans, we are more inclined to correlate things that are conveniently and easily with visuals, symbols, infographics, and pictures. As we can see, the impact of fashion industries on our economy is significant. Thus, it directly correlates to the product itself on how it’s being marketed and the whole process. That brings us to the fact that the presentation of the product is very important, so important in fact that it has a direct effect on sale increase. Based on this fact and many others we at, Color Experts International (CEI) have architected and designed our photo retouching services in a broad manner so that our customers can easily find what they need. In Photoshop, we have dozens of different tools to carry out these tasks. It depends on where to use and when to use. With the help of layer and layer mask tools in Photoshop such as pen tool, healing brush tool, spot removal tool, stamp tool, and other cutting tools we can pull of the task. No matter how deft the photographer is sometimes it’s not just possible to get the perfect shot without retouching. Tiny objects in the photo, camera shake or sometimes for camera and lenses photos turn out as not what we were looking for. But that doesn’t mean it’s not possible to retain the result that we want and to do that we need photo retouching. Through these services, we can change the aesthetics of the photographs to make it more eye-catching. Make the color right, balance the background color, smooth out the skin, get rid of the pores and wrinkles, blemishes, etc. are the basics of what we do in photo retouching. Based on what can be done in photo retouching we have designed two core services. And under these two categories, there are several sub categories to choose from. We have jotted down all the categories and sub categories and elaborated below. In this category, we have scraped the surface of all the fashion accessory items and then we filtered some of them out so that it is easy for our customers to choose the right photo retouching service for their fashion accessories. In footwear businesses, it’s very important for a product to be as eye catchy as possible. It is a basic requirement for a brand or a company to always upgrade their catalogs and online portfolios with ongoing product range by maintaining consistent photo quality. Nowadays, with the ever growing popularity of online and ecommerce businesses, this service holds its utmost importance. Watches are one of the main concern when it comes to fashion wearable. For a fashion conscious person watch is a must have. To meet these demand business owners always need to update their catalogs with alluring photos of watches. Consumers of today are engaging with your brands and products online and the engage to buying ratio is also pretty high. As a commercial product photo retouching company, we are here for you to get the best out of your business. Handbags and wallet play an essential role in both men and women’s lives. While carrying our everyday essentials, it also carries the personality of the holder. These are considered as a fashion statement where it has the ability to either change it or make it. Bags and wallets retouching requires high-end photo manipulation. It requires high-end skills of color corrections, understanding color science and so on. Since more and more consumers are now directed to the online market, it is high time to update your catalog and online portfolios with ongoing product range maintaining consistency. Hats are the most noticeable accessories in terms of fashion. Because onlooker’s attention is first drawn to the face. A hat is the most perceptible fashion items that anyone can wear. There is that old saying, “If you want to get ahead, get a hat”. So the importance of hats is nothing but prominent in fashion. That is why it is also very crucial for these kinds of product to be retouched extra carefully. Hat photo editing needs heavy photo retouching and color correction, cleaning, adding contrast and background, smoothing scratches etc. This brings up the idea that your collection and range of product should be retouched to get the most consistent result for any online businesses. Socks and Gloves are the only products that can be used both as a fashion accessory and as a safety accessory. In winter, these can comfort us by offering its warmth and in fashion, it can blend with so many styles. No matter what you use it for, it has its importance in both sectors. This automatically translates its popularity and demands captivating online presence. Retouching gloves and socks require high-end editing skills, photo manipulation, color correction and so on. We have a dedicated team for fashion retouching & fashion photo editing. Most of the time fashion photography needs retouching service, ghost mannequin editing is a common requirement for e-commerce. Styles of sunglasses evolve so much over the last decades that it can be hard to cope with their latest trend. It enhances one’s look by a huge margin. For fashion addicts, this is the most common fashion accessories to wear. This can also be considered as a luxury product as the price can go as high as up to thousands of dollars. So, the need to refurbish the catalog for grasping the customer’s attention is essential. Jewelry photo retouching needs heavy retouching like color grading, color correction, smoothing, cleaning, adding contrast etc. but for jewelry like a bracelet which flexible and rich in design, it demands extra attention to details. Bracelets are at the forefront when it comes to fashion. Consumers are always eager to have the latest trendy ornament in their exposed areas. So, for jewelry business owners, it only makes sense to have the collection of their catalogs and online portfolios always up-to-date with ongoing product ranges maintaining consistent photo quality. Among all the retouching services necklace and pendant retouching is the hardest. To do the post processing task, it demands the editor’s full attention and skill set. These kinds of retouching need the cleanest processing and smoothening without losing the details. 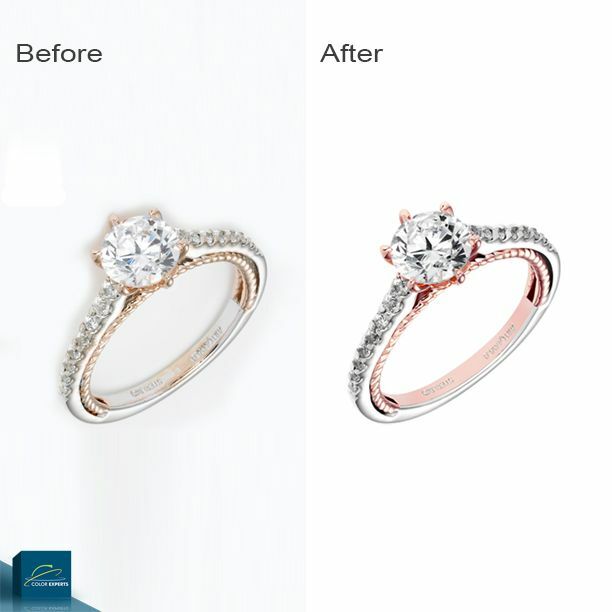 Our expert retouching artists help to produce consistent color and look & shine for gold, silver and diamond items across different jewelry photo shoot. In order to maintain the business profile, it is very important that you are always up-to-date with your catalog and maintain consistent quality. Here at CEI we offer best in class service to our clients and which is most complex compared to others. Earrings are one of the popular ornaments that girls and women of all ages love to wear. As a fashion jewelry, it has a very exquisite presence. Like other jewelry products, it is also very important to retouch the photos in a way that it doesn’t harm the details of the picture but smoothens the scratches, corrects the color, balances it and then adds the contrast. As an online business owner or an ecommerce business holder to maintain the quality or the expected business profile one must be consistent with the ongoing product image. 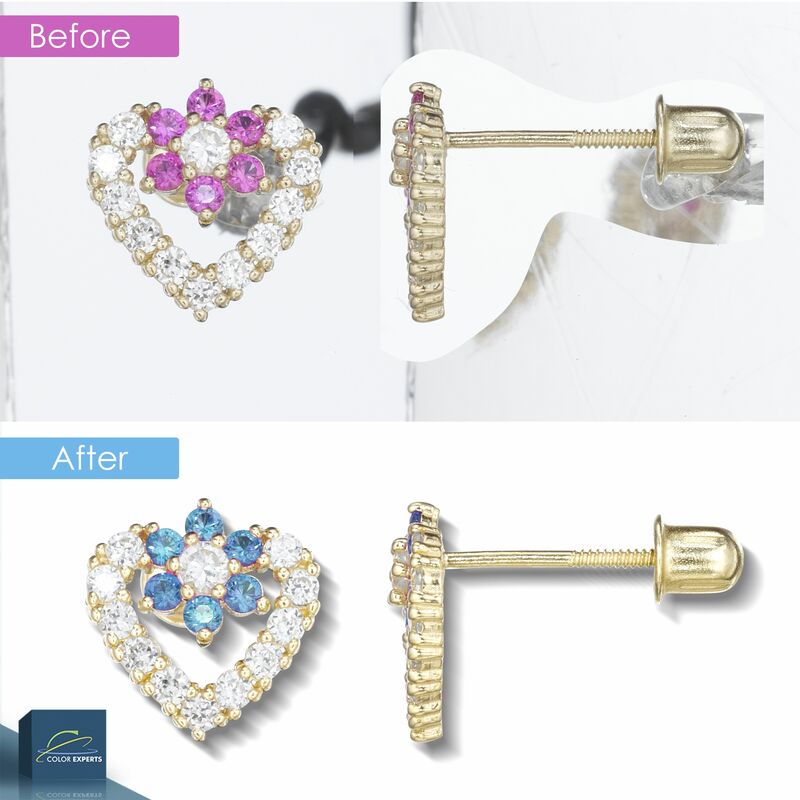 Our team of professionals does exactly that as the earring photo retouching service. Like other fashion ornaments, finger ring has its own little presence on the fingers on your hand. It has more significance, though, as it plays important role in a ceremony like wedding or engagement. So businesses involving this jewelry are also very sensitive about their presentation of products. Normally it’s very tenacious job when it comes to retouching finger rings because it requires all the attention and the skills of a designer to get the best out of the product photo. We are glad to admit that we have a team of dedicated professionals who are specialist in jewelry photo editing. Fashion apparels retouching is just the other side of this retouching service spectrum. In this section, we have detailed the retouching services for apparels and list them in an easy order so that you can find your specific category just by hovering over this presentation. Selling apparels online nowadays is getting very popular. While ecommerce can surely boost your sell, it is your product that has the appeal to attract the customers. Apparels like Shirt and T-shirt needs extra care and effort while retouching for online buyers. For customers who are buying things online, it’s very important that they get the best experience viewing the product in a different angle and everything including the inside and outside design and the zoomed in snap of the fabric materials, etc. We have a dedicated team of experts who are specialized in retouching and editing the Shirt and T-shirt photographs. Most of the fashion photography needs high-end retouching and ghost mannequin technique is pretty common in editing these kinds of product. Keep your fashion photo catalog for shirt and t-shirt always up-to-date with ongoing trends maintaining consistent photo quality. This category includes a variety of dresses ranging from normal single kameez to party dresses for women and girls. What makes this category different from others is its versatile design. Retouching a wedding dress is kind of same as retouching a girls party dress with a lot of details. This requires very sharp skills as the designers might need to do the advanced masking to remove the translucent background and retain the transparency and do all other nifty techniques. We are confident to admit that our team has highly skilled experts who know the basic needs and requirements to do this job. This category of service especially applies on pans and trousers as mentioned in the title. Retouching pants and trousers include ghost mannequin technique to retrieve the product from the background. Not just that, in this service sometimes it also requires to remove the wrinkles from the fabrics and adding missing parts. We have our team of experts to carry out this task. With a range of working experience on apparel retouching they know what is needed and what not. At Color Experts International, Inc. (CEI) we maintain and reduce our client overheads of managing team sizes with fluctuating and seasonal work volumes, with utmost quality control and operational efficiency. Like all other fashion apparels, retouching Hoodies and jackets can be a challenge. To present this product online, it needs to be polished and well balanced in color and sharpness. This is a seasonal product for winter and has implacable effects on winter fashion. So to push these items to their full potential most of the time this type of fashion products needs heavy retouching and ghost mannequin is the most important and very common for online and ecommerce businesses. Fashion retouching for Hoodies and jackets requires high-end skills for photo manipulation, color correction, understanding of colors & bringing life to photo. Our highly experienced team focuses on delivering a realistic feeling for fashion photography retouching. From bulk discounts to compact packages, we offer various benefits to our customers. Here at Color Experts International, Inc., we offer the best Fashion photo retouching when it comes to retouching fashion accessories and apparels. Here is a list of advantages of choosing us over others, but this list by no means is limited to the following. Color Experts International, Inc. (CEI) has been providing best in class bulk photo editing services for the past 30 years. Throughout this experiences, we have learned what our clients actually want in their finished product. We have specialized in online based marketing platforms and ecommerce. So we are familiar with the rules and regulations that those platforms need. With a perfect blend of experience, skills, dedication, and punctuality, we offer a wide range of image editing services which can assure you the perfect quality finished work. We have served more than 10,000 clients at both SME and Corporate level. Many new customers also turn to us for reliable image manipulation services. You don’t have to believe our words, try us and hit the Free Trial button. If you are familiar and already convinced with our services then send us Request a Quote for our latest offerings.